Each solid metal 6 in. spike offers balanced precision for throwing or other emergency covert operations. All 3 spikes fit securely into the nylon sheath with adjustable straps for ankle or forearm fastening. Bought these awhile ago and am planning on getting another set since I lost my first one. Very good set, well balanced and sharp. The tips do bend easily however, but easy fix with some pliers and a sharpener, but my biggest problem is the sheath. Would definitely recommend getting a custom for the spikes, as the Velcro fell apart easily and the straps sucked. Also the spikes didn't stay in the sheath very well, they liked to slide out if I moved my arm too much, and I have stabbed myself a few times due to this. Overall, great spikes, crappy sheath, so new one recommended. 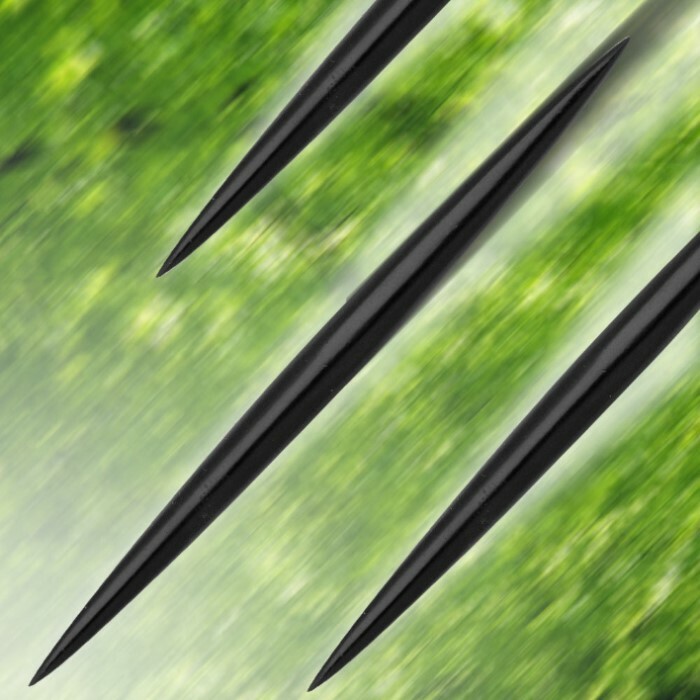 good spikes tips bend easily can lose in tall grass. Never used throwing spikes before but bought these to fill up an order for the free shipping. First throw I put one in the bullseye, I know beginners luck because it took several throws to do that again. I do enjoy these though. Good for a beginner like me but watch those points, they are sharp. The only reason I didn't give 5 stars is due to the sheath. IMHO the sheath is too thin and backwards (of course you could lengthen and shorten the straps), I think the exit should be toward the hand for fast side throwing. I like these enough that I am trying to order more but they are out of stock. I may make a leather sheath, as another reviewer mentioned, that fits on my arm the way I want it. 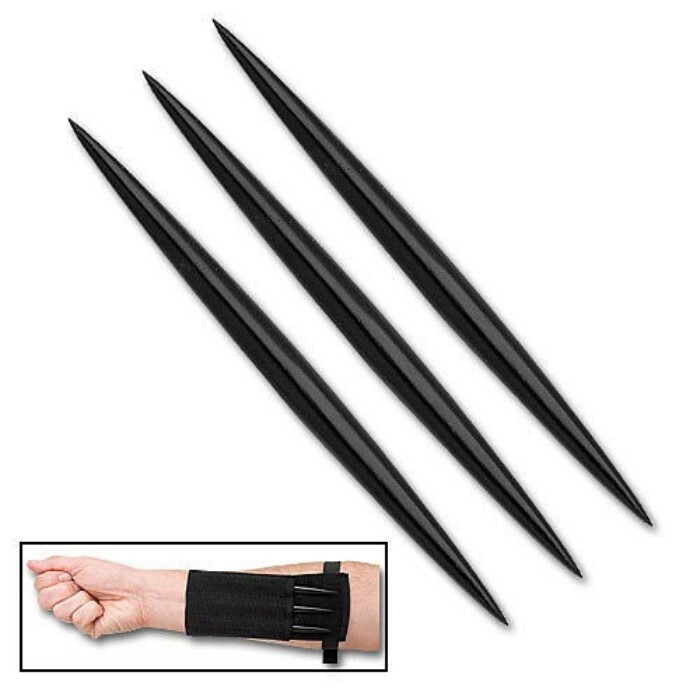 I use these in a martial arts class and they work fine for beginner and student usage. Great for getting introduced into the throwing arts. I have ordered literally dozens or more products from BudK. I have also been ordering for at least a decade. These throwers are complete crap. First throw....I fishhooked the point of the first thrower. second throw.....broke the tip off the dart. Third throw....blunted the pointed severly. and all thrown into a nstandard horse hair dart board. Im sorry BudK...weak sace. And a shameful representation of your FINE liner of goods. I dont ever wine....but GEEEEEZ!!! These are great. If you know what you are doing they stick well and go in & out of sheath nice. Sharp out of the box. I would recommend these for anyone who likes to throw spikes. Good weight good for throwing. Well balanced. Only problem is the nylon sheath for the arm is not designed for such sharp objects. The spikes pierce through and into the arm and the Velcro feels like it is on backwards and cuts into the wrist. The tips of the spikes were needle thin and bent through shipping. I'll make my own sheath from leather which was a goal anyways. very good quality. just makes sure you know how to throw them for you will easily get hurt if u dont. Rinkachi recomended.